Foreman-Slaasted Heating & Air Conditioning is a home comfort leader in the greater Racine and Kenosha areas—and we have been for over 25 years. In addition to outstanding customer care, homeowners trust us to deliver tailored comfort solutions that actually make a difference. Our knowledgeable technicians specialize in furnace and air conditioner service, including installation, repair, and maintenance. We also recommend and install boilers, heat pumps, and indoor air quality products to keep you truly comfortable. We know which system will best fit your home and comfort needs, and how to keep it running efficiently for as long as possible. 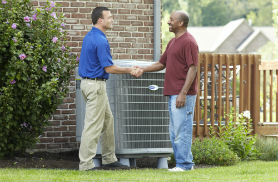 Let us provide a free estimate on a reliable Carrier® system to help you feel more comfortable at home. You can also count on us to be there if your heating or cooling unit breaks down, with 24-hour emergency service to get things up and running ASAP. 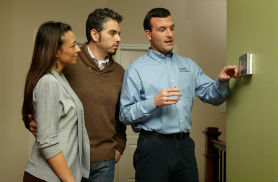 The next time you need HVAC help, keep our team of friendly, reliable experts in mind—we’re here for you. Our trained technicians service all makes and models of heating systems—and proudly recommend and install Carrier® products. A well-known name in the HVAC industry, Carrier systems—particularly its gas furnaces—are ranked among the best by top consumer magazines as well as Racine homeowners who trust this brand and our company for comfort. Our reliable service guarantees your 100 percent satisfaction with a heating system that meets your home needs and could help you save up to 30 percent on your heating bills during the winter. 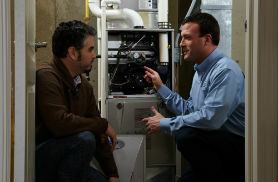 It’s vital that air conditioners and heat pumps be sized and installed properly so they operate at peak efficiency. Since every customer and every home is unique, we go above and beyond to design a system that delivers all the comfort and cost-saving benefits you want and need. We also take great care to design custom comfort solutions for our customers. Schedule your free, no-obligation, in-home consultation here or call us at 262-634-8344—we’re happy to discuss the best cooling solution for you. Every family deserves fresh, healthy indoor air. But pollutants, especially the ones we can’t see, make their way into our homes every day. Some—like dust, pollen, pet dander, mold, viruses, and bacteria—can be harmful to your family’s health. According to the Environmental Protection Agency, the air inside your home can actually be up to five times dirtier than the air outside. Our pros can recommend a wide range of air quality solutions to help you breathe easier and alleviate respiratory irritations and allergies. Learn more about indoor air quality and what you can do to improve yours here.